Modern styling, easy closing trip latch. Reversible for right or left hand doors. Positive padlock feature. 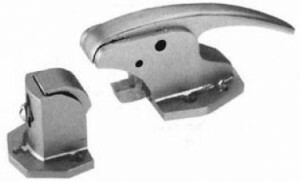 Available flush to 1-1/4″ offset. Body, strike and handle made of stainless steel. Bolt is made of brass. Holes drilled and countersunk for No. 9 screws. No. 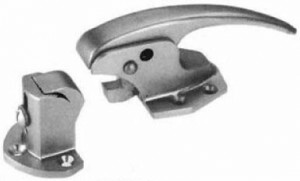 508 Modern styling, easy closing trip latch. Reversible for right or left hand doors. Positive padlock feature. Available flush to 1-1/4″ offset, but Polar No. 507 larger. Made of chrome plated zinc die-cast. 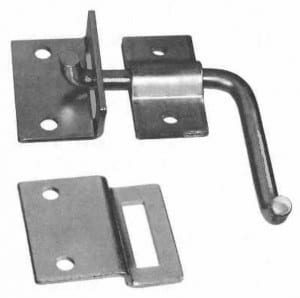 Strike id adjustable from 3/4″ to 1-1/4″. Holes drilled and countersunk for No. 10 screws. Weight – 2 1/4 lbs.